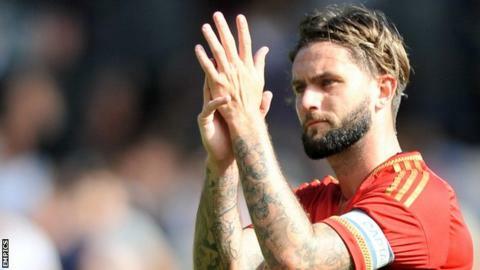 Nottingham Forest have confirmed that midfielder Henri Lansbury will stay with the Championship club. The 24-year-old had looked set for a move to Burnley, with the two sides in contact about a deal. But a Forest statement said: "The 24-year-old has declared his intention to stay following a conversation with (chairman) Fawaz Al Hasawi. "The club welcome Lansbury's decision and will now move forward with him in their plans." Lansbury, who had loan spells with Scunthorpe, Watford, Norwich and West Ham when an Arsenal player, is currently the Reds captain. Al Hasawi tweeted a picture of himself and the player, saying: "Henri is staying with us."